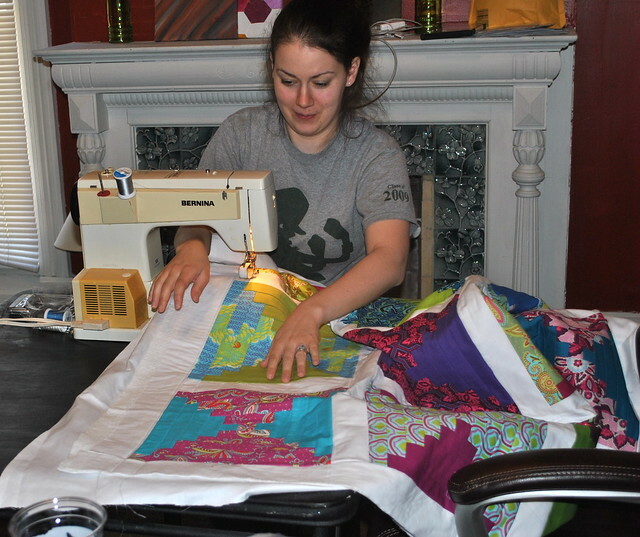 I'm now fully recovered from the crazy fun quilting weekend! 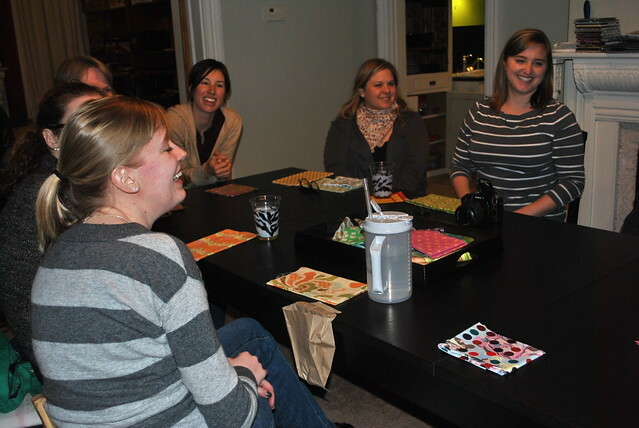 Remember when I told you I was hosting a retreat for the Indy Modern Quilt Guild at my house? We started off Friday night with dinner and a little show and tell. 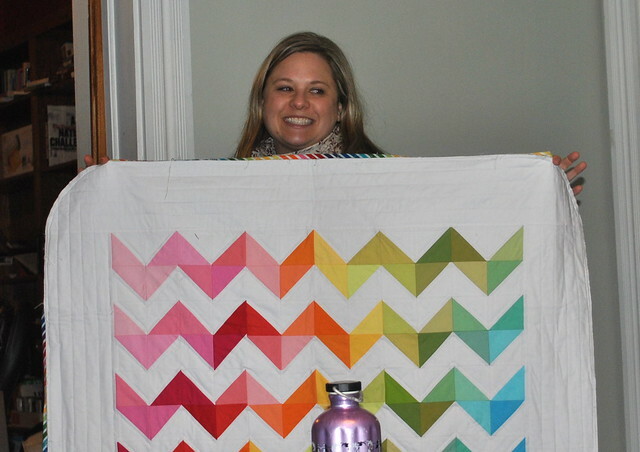 Here is Lindsay L.'s second Friday Night Brights Quilt. She's teaching a class and writing a pattern for this one! 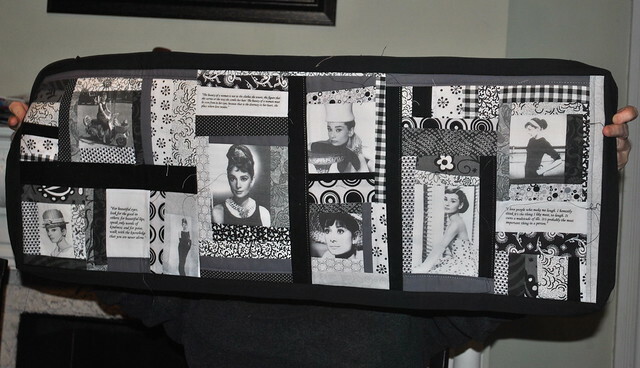 Jenny's Audrey Hepburn Runner. Love the printed photos and quotes on fabric. She brought another one that features Marilyn. 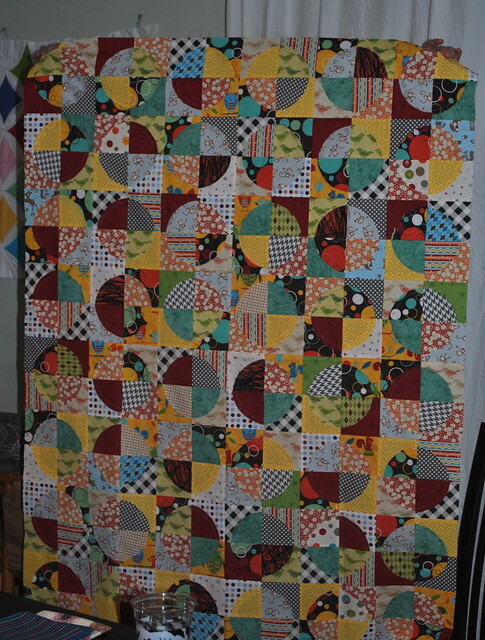 Elizabeth's latest baby quilt top, from a Cluck Cluck Sew pattern. It's raw edge applique, and she says it went together so quickly! 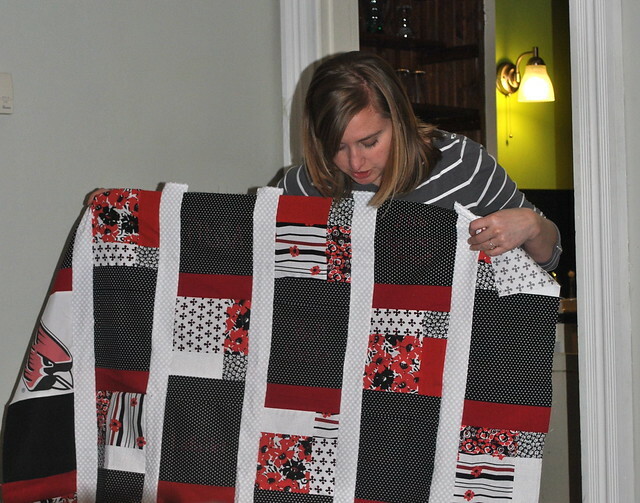 After show and tell, we played a game I borrowed the Philly Modern Quilt Guild retreat. For the LRC Fat Quarter Game, everyone brings 3 fat quarters. You can roll a special LRC dice, or use scrabble letters like I did. Everyone takes a turn drawing a letter out of a bag, and either passes a fat quarter left, right or to the center pot. You only draw a letter if you have at least one fat quarter remaining. The person to have the final fat quarter in hand wins them all! This was a lot of fun, and very suspenseful, because even after you are out of fat quarters, you are not necessarily out of the game, because someone can still pass one to you. Then we drew names for door prizes! Acquiring door prizes was the most fun part of planning this retreat. 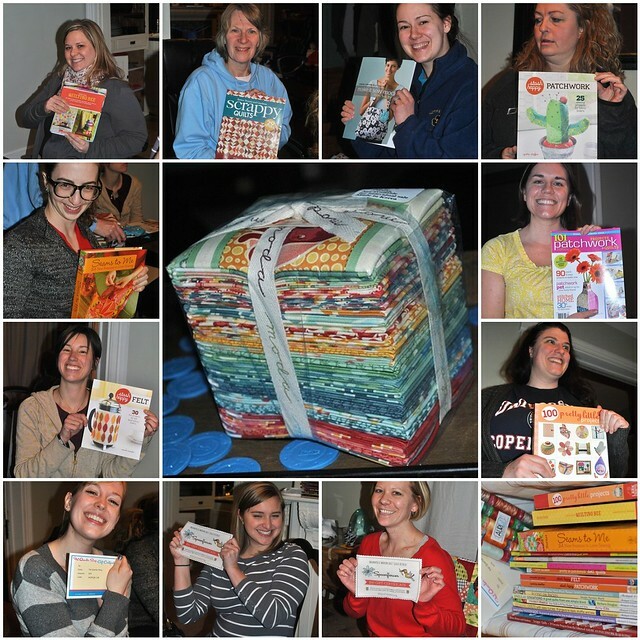 Companies I wrote were so generous to donate books, magazines, fabric, gift certificates, and notions. We played the LRC game again with poker chips to award the coveted Salt Air fat quarter bundle that was donated by Moda, and Tisha (one of our guild officers) took that one home. Congrats! 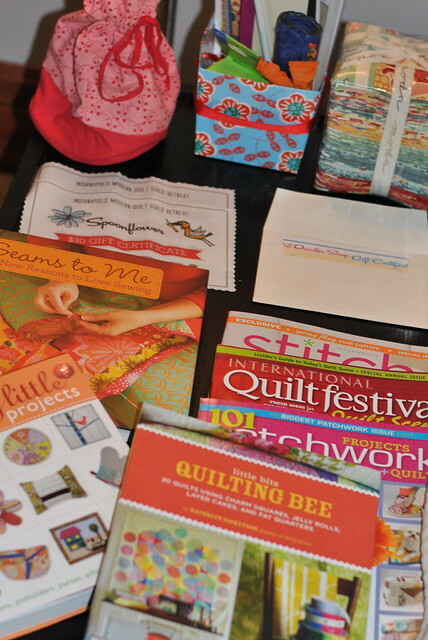 For those who are interested in organizing a retreat with door prizes, I simply wrote the publicity contact or filled out a general contact form to get in touch with companies whose products I feel our guild would really love and resonate with. About 6 weeks before the event, I wrote and politely asked if they might be interested in donating a door prize. I also said we would be happy to give an update after the retreat and blog about the event. The response was incredible, and about two-thirds of the companies I wrote agreed to donate a door prize. Several donated an entire box of goodness! Also, everyone at the retreat got a goodie bag with a 5-pack of Aurifil Thread and a Lapel Stick to try out. 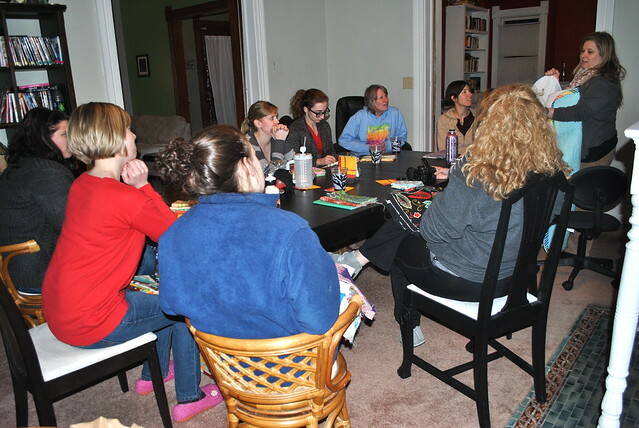 After we divvied out the first round of prizes (we had enough donations to do another door prize drawing the next morning! 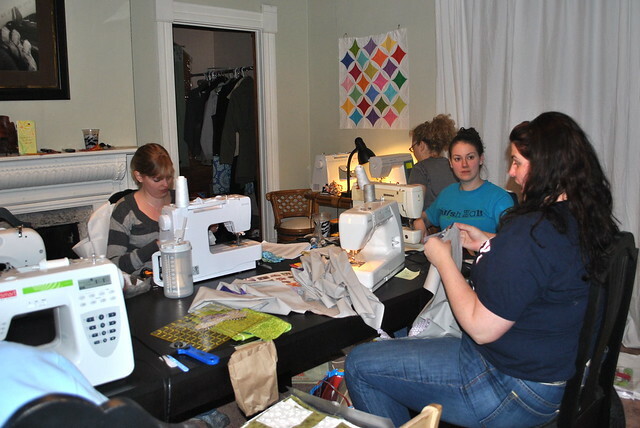 ), it was time to bust out the sewing machines. I snapped a few shots of what everyone worked on. Here are Katie's cross blocks. I love how big they are! 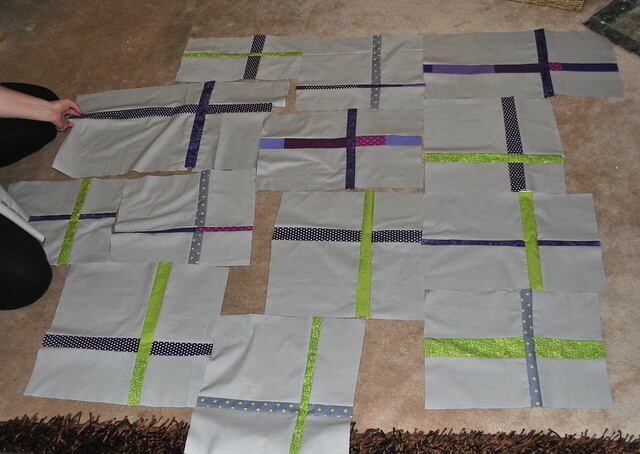 Amy's courthouse steps quilt went from being in rows to basted (with a pretty pieced quilt back), and she got started on the quilting. They are so pretty! 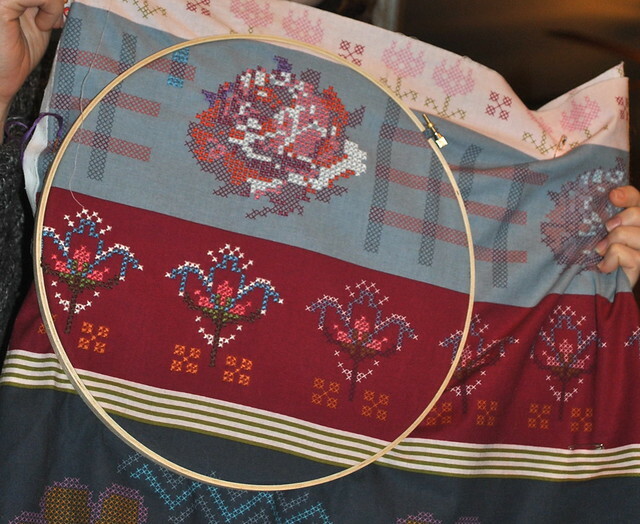 Rachael's Anna Maria Needleworks project. It's going to make one gorgeous skirt! 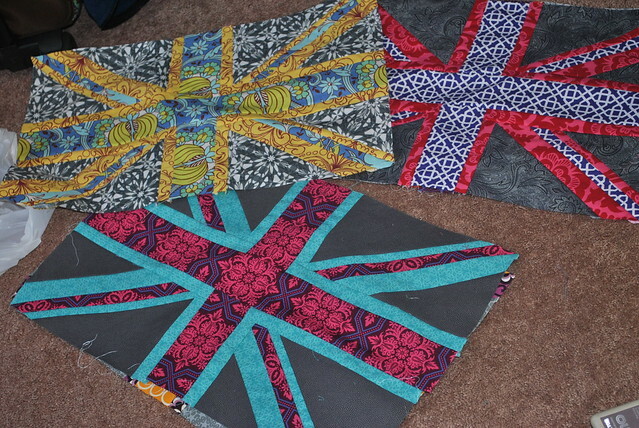 Holly's Union Jack Blocks. Not only are the colors rich and beautiful, but Holly grew up in the U.K., so it's a natural fit! Hostess Gifts! 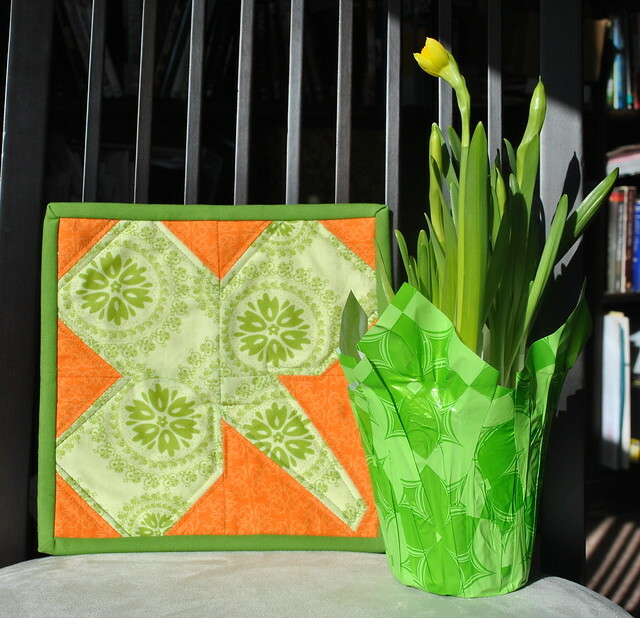 A clover mug rug from Jenny and a Daffodil plant from Holly. I am in love! Looks like a great time, Lindsay! Sounds like a fab weekend, and great prizes! Excuse my ignorance, but LRC?! What a fun retreat! 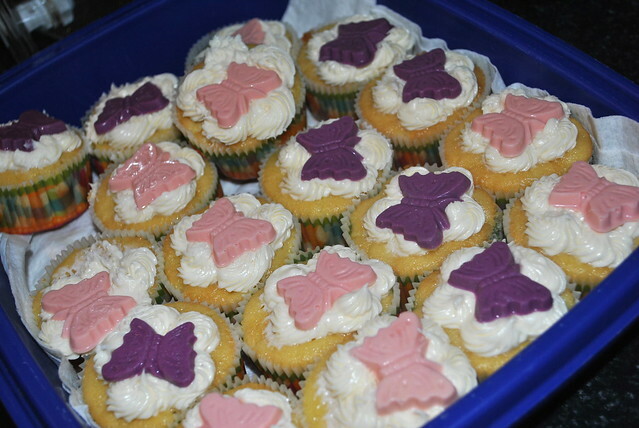 I'm glad it went so well and that you were able to get such wonderful door prizes! It's so fun to not only go to a fun event like that but to come home with an extra bit of goodies. 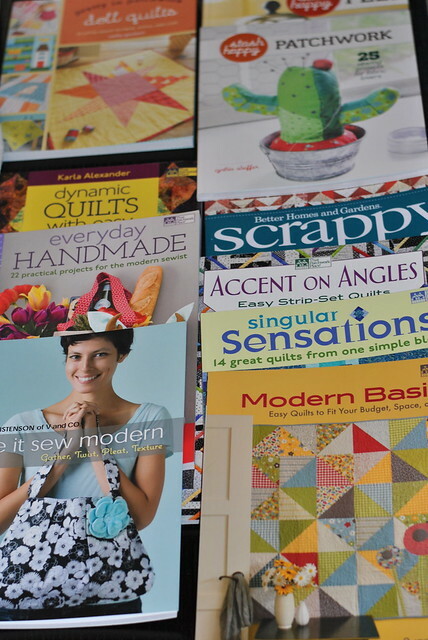 And everyone's quilts are soo beautiful. Thanks for sharing. So fun! I would love to do this with crocheting friends. Did you charge for the event, and did you invite personal friends or did you advertise somehow?